WILLIAM SHANNON. 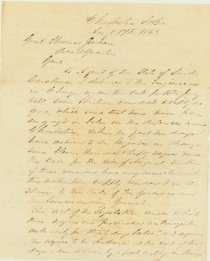 Autograph Letter Signed, to General Thomas Jordan. Charleston, August 17, 1863, 2 pp. With: newspaper advertisement, entitled: “Labor For Coast Defences,” a public letter from Governor M.L. Bonham, August 19, 1863, 1 p.
As agent of the State of South Carolina I delivered to the Engineer in charge, under the call for 15th July ult some Thirteen hundred & fifty negroes, which since that time have been engaged in labor in the defences around Charleston, Within the past two days I have delivered to the Engineers in charge some eleven hundred & fifty negroes under the call for the 14th of August. Neither of these numbers have any connection with the voluntary supply rendered in response to this call of the Governor and the Commanding General. The act of the Legislature under which these Negroes are furnished authorizes the call only for ‘thirty days labor,’ and requires the negroes to be discharged at the end of thirty days when relieved by a fresh supply, authorized  by the enactments of the law, by the practice of the past six months, & by assurances of the Confederate authorities I have not hesitated in all my calls to the people to pledge the return of the Negroes at the end of the thirty days & the people of the State have relied on my pledge. I am officially identified with the success of a scheme which I have labored earnestly to make efficient, outside of that motive no man can be more deeply interested than I am in the success of the defence of Charleston, but I feel constrained from a sense of duty to ask the discharge of those Negroes furnished under the call for the 15th July, who have worked over thirty days and which are relieved by the supply rendered in the past few days. The motive prompting this direct application is that I am informed by the Engineer Department that the Negroes could not be discharged. Agt of the State of So. Ca. 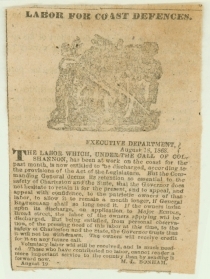 The labor which under the call of Col. Shannon, has been at work on the coast for the past month, is now entitled to be discharged, according to the provisions of the Act of the Legislature. 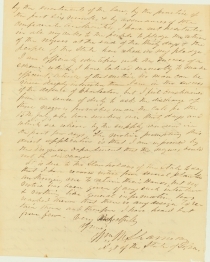 But the Commanding General deems its retentions so essential to the safety of Charleston and the State, that the Governor does not hesitate to retain it for the present, and to appeal, and appeal with confidence, to the patriotic owners of that labor, to allow it to remain a month longer, if General Beauregard shall so long need it. If the owners insist upon its discharge, on application to Major Echols, Broad street, the labor of the owners applying will be discharged. But being satisfied, from personal observation, of the pressing need of this labor at this time, to the safety of Charleston and the State, the Governor trusts that it will not be withdrawn. The owners will receive credit for it on any future call. Voluntary labor will still be received, and is much needed. Those who have contributed no labor, cannot render a more important service to the country than by sending it forward now. 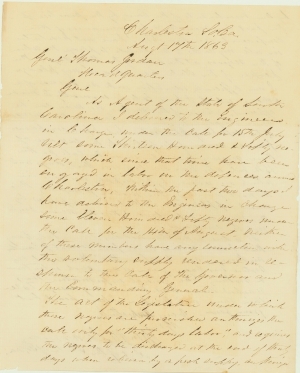 Shannon requests the discharged of slave labor used in coastal defenses in the summer of 1863, but as Union forces encroached upon Charleston, and especially after repeated attacks on Fort Wagner on Morris Island, Confederate authorities scrambled to build up Charleston harbor’s defenses. Thomas Jordan (1819-1895), a Virginian, was the roommate of William T. Sherman at West Point, graduating in 1840. He served in the Mexican War, and was assistant quartermaster on the eve of the Civil War. He served as a staff officer throughout the Civil War, most prominently as chief of staff to G.T. Beauregard. He was promoted to brigadier general for valorous service at the Battle of Shiloh.